It has always been a fantasy to hack Facebook accounts or your friend and do pranks using his Facebook profile. Facebook, one of the worlds most famous and most visited social networking website. Anyone, whether it may be a student, housewife, cricketer, film star has a Facebook account. Today I will show you how we can have access to Facebook account and can play pranks!. 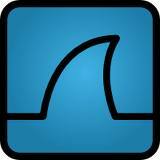 We will be using a Network Security Analyser tool "Wireshark". Also this trick can be applicable only on those Facebook account which are being used in your LAN. Using this trick you will get access to the victims facebook account such as reading and updating statues, commenting on posts, liking posts, Adding, deleting friends, but you will not be able to get the victims password. We are using Wireshark to hack into the victims Facebook account but not cracking his Facebook password. There are chances that we may get succeeded in changing the password but in any case we wont be able to fetch the password used to login into the facebook account. The method used to Hack the facebook account is Know as Men in the middle attack (MITM) and we use ARP Poisoning technique to get the access to the account. The procedure for both Network with Hubs & Switches and Network with Routers remains same in Wireshark, only difference will be to use ARP Poisoning prior to using Wireshark. 1. Open Wireshark, look at the menu bar you will see capture menu, in capture dropdown menu u will see Options, click on it. 2. Now a new window will appear and then select your interface "Realtek" as in my case. This differs depending upon the model of your motherboard. If you have only one Network Interface or LAN card as is the case in many desktops, then you will find only one Interface by default. But if you are using it in Laptop, which generally has LAN Port as well as Wi-Fi Adapter, there in this case you will find two interfaces, choose the one which is your LAN interface. 3. After selecting your LAN interface click on Start, it will scan all the packets available in your network. Scanning the network means each and every data packet is captured and it is analyzed. The Network cable, which we have got from ISP, contains lots of packets and every second thousands of packets are sent and receive via Network Interface card. Please note that before starting the process, make sure you have directly connected the LAN cable to your LAN Port. Make sure that the LAN cable which comes to your places from ISP is directly connected. It should not be routed through and Home routers or and Layer 3 devices and if it connected to any router or Layer 3 devices then make sure the network is poisoned with ARP Poisoning. 4. Now go to command prompt if using windows and in case of Linux go to terminal and ping for Facebook.com. When you ping for facebook.com, you will be able to get the IP address of Facebook. You can type “Ping faceboo.com” in command prompt to get IP address. Please make note that the IP address of Facebook may differ in your case, as Facebook has many server and depending upon the location and the traffic at the server, the IP address may differ. 5. Once you are able to find out the IP address of Facebook, all you need to do is to filter the network packet which you are capturing in Wireshark with this IP address. Go to filter option below the icons near to menu bar and paste the IP address and filter the packets. 6. Now you have all the packets of your LAN Network who are using Facebook. Previously we had filtered our packets on basis of ARP protocol, now we will be using HTTP protocol, as previously done click on the Protocol tab above to sort on the basis of Protocols and then scroll to HTTP protocol and search for entry with GET /home.php. This may vary depending on region and time/zone but don't bother try to search all packets with HTTP GET for cookies. 7. Now from packet details window, this is located downside of the Wireshark window. Expand the packet information for above packet and you'll get 8-10 different cookies that are stored by www.facebook.com on victim's PC. Right click and copy all cookies names and values in notepad. Make sure you do not miss out any of the cookies which Wireshark has captured. 8. Now open Mozilla Firefox browser, Go to tools menu and open Cookie editor. 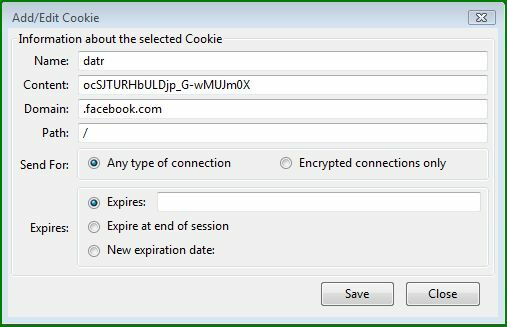 Add each cookie which you have found out using Wireshark to your cookie folder using Cookie editor and save it as below. 9. 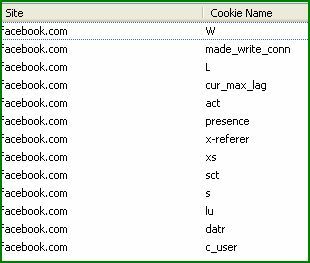 After adding each cookie value obtained from Wireshark, your cookie editor will show screen similar to following screen in cookie list for Facebook. Woaho! 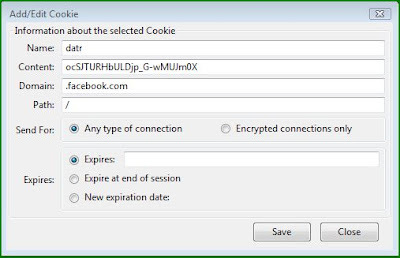 That’s it, close the cookie editor and open facebook.com, you will be logged on to victims Facebook account directly without entering username and password. Make sure you have enough packets before you start the process and this trick will work only when someone in your LAN is using Facebook. It may happen that many users may be using Facebook in you LAN at that time when you are capturing the packets, in that case the user whose required cookies has been added in your cookie editor will be logged on. It is very difficult to differentiate between different users via cookies, so if you have relevant cookies then you will definitely be logged in to victims account.